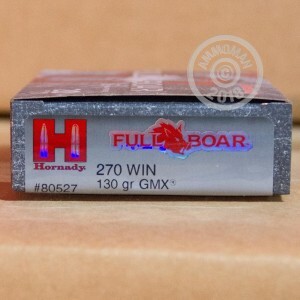 This round from Hornady is a Full Boar 270 Win 130 Grain GMX. Hornady prides itself with producing high quality ammunition so that you can trust your shot next time you are out hog hunting. The GMX bullets use a solid copper alloy design with a polymer ballistic tip. Hornady is one of America's most renowned bullet manufactures and its loaded ammo is engineered to take full advantage of its innovative designs.